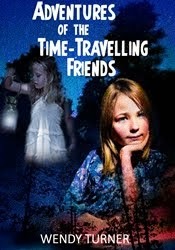 Adventures of the Time-Travelling Friends is about 14 year-old Beth who has to stay with strange old Aunt Hypollita (Aunt Hippo) while her mum has a baby. Beth shows off about going but once there, gets to quite like funny Aunt Hippo. One night Meg, a girl who lived in Aunt's house in the 1780s magically appears in Beth's room and they become friends. The story flips between Beth's time and Meg's time. Meg's mum plans to marry Meg to a rich Scottish Lord who the girls call 'The Fuzzy Ginger Beard'. It's up to Beth to save her with the help of Meg's friend Bryan and his beautiful horses and Marigold Maybelle, a good witch who makes magic with her rap songs! All the time the girls have to dodge nasty Seawick, Meg's mum's sinister manservant who they suspect of stealing Meg's last treasure, her lovely silver Chalice. Can they find it and save Meg from the Fuzzy Ginger Beard? Buy Adventures of the Time Travelling Friends from Amazon now. © Wendy Turner. Powered by Blogger.